One of these effects is the worldwide spike in infectious diseases, as suggested by a study recently published in the journal Proceedings of the National Academy of Sciences. The study (Predator diversity, intraguild predation, and indirect effects drive parasite transmission) explores how the diversity of small predators shapes the transmission of parasites in wetlands. 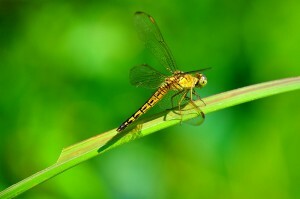 The study, which included a series of laboratory experiments, field surveys and mathematical modeling, shows that — in presence of various species of dragonfly larvae — there is a reduction of frog infections caused by trematodes, which are parasitic flatworms also known as flukes. The dragonfly larvae are small predators that eat trematodes. Val Beasley, senior author of the study, said in the press release that various species of trematodes penetrate tadpoles. The trematodes sometimes kill the tadpoles. In other instances, the trematodes weaken them by causing tissue damage, kidney failure, or severe limb deformities while the tadpoles develop into frogs. He added that other vertebrate species commonly catch trematode infections from bodies of water. These vertebrate species include wildlife, domestic animals and humans — mostly children — who are commonly affected by schistosomiasis in tropical parts of the world. Schistosomiasis is a parasitic disease carried by freshwater snails infected with one of the five varieties of the parasite Schistosoma, a type of trematode. Although the worms that cause schistosomiasis are not found in the United States, more than 200 million people are infected worldwide. While most biodiversity research focuses on variations of the parasite hosts, this study highlights the role that the diversity of the predator species (in this case the diversity of dragonflies, which attack the flatworms) play on infectious diseases. Further work on the diversity of predator species able to decrease parasite populations may be crucial for the management of infectious diseases. This post first appeared March 23, 2015, on The Global Fool. It definitely makes sense that decline in the population of an organism that prey on other organisms that are parasitic to humans lead to higher human infections and diseases. All the organisms on earth are highly interrelated that it’s easy to cause our ecosystem to be off-balance. It’s hard to fight diseases arising from decreases in biodiversity just with our immune system and vaccination. Therefore, it’s in our best interest to make an effort in preserving biodiversity, one of the factors that can cause infectious diseases. This led me to think if there are any other reasons why there is a worldwide spike in infectious diseases. Few reasons that I came up with are: (1) more disease that weren’t recognized before are becoming known and categorized; (2) increase in the density of human population contribute to disease spreading; (3) people can now travel to places where they were not immunologically exposed previously and they can also introduce diseases across the world. Now your third reason is an interesting one, which makes me think of several examples. With all of this globalization occuring, diseases are now record holders for traversing the planet. International airports have to screen for diseases because they could develop one morning in china and be in the U.K. for tea time. Co-evolution with pathogens has led to some very hard times in nonimmunized individuals. Smallpox reached epidemic proportions in the native american population around the height of the settlement of The New Land. Before that a pathogen traveled over seas to bring the plague to europe and defined a whole era. Reason number three does not directly concern biodiversity and is a better model for instances of widespread human pathogens. Cases where introducing animals and plants to ecosystems is a good way to throw things out of whack though. We georgians are reminded of this every day through kudzu. Its generally just a bad idea to take an organism from a system and introduce it to another, because important checks and balances will be absent. The organism can either die, leaving a fallout within the delicate balance or dominate to a point of harm. Another reason for the worldwide spike in infectious diseases may be climate change. Vector-borne pathogens , such as malaria are typically associated with tropical climates but as our planet warms the range of these pathogens will increases. New populations will be exposed to these pathogens that never encountered them before. Climate change has also been linked to an increased frequency of flooding–allows drinking water to be contaminated with waterborne pathogens more often. Speaking of climate change, another good point was brought up in class. The increasing water levels will eventually lead to the flooding of cities that are at sea level, below or only slightly above. This new environment that is swamp-like will be a nesting ground for all sorts of parasites that thrive in water and could potentially lead to outbreaks in the animal population. There is no question that human activities have led to climate change, causing a multitude of interconnected issues like rising water levels that as previously stated cause an increase in parasites and pathogens. Another human activities that could also lead to the increase in parasites and pathogens is deforestation. When humans take over the natural habitats of the predators, they often time kill the predator. An example of this in history is in the 14th century. As the human population grew and they started expanding their environment, they started killing snakes to make the land most habitable. By doing so, this lead to the increase of mice ( their prey) that carried the flees which contained the bacteria that caused the bubonic plague. In modern times, people have an irrational fear of spiders and kill them as soon as they come across one. Little do they know that each spider can kill a few hundred if not thousands of insects that could potentially be housing a parasite. These findings definitely jump start the discussion of evolution. If the climate change and the rising water levels with induce more water-borne illnesses, will the human race evolve over time to fight these infections as it has fought the contact and air-borne diseases? Evolution is supposedly how all the biodiversity came about. Will it fix itself in the light of the sixth extinction? I also wonder if increased human effort to “fix” the problem will lead to a more disastrous outcome. Generally rising sea levels there would be bigger issues than water borne illness effecting more people. As the salinity changes of both surface and ground water, we as humans would not be the only ones having to adapt but so would everything else in the environment. So what’s to say that shift in salinity and water hardness might not affect certain pathogens negatively. For example the trematodes, lets if the salinity rises it would negatively affect the frogs the infect, so they in turn would suffer. Then with climate change there could be issues of now areas that historically were very arid getting more precipitation or vice versa. The organisms there would have to cope with the new conditions or die out. Which if they do we are looking at a big loss in biodiversity in the short term. The concept when you just think about it in passing makes a lot of sense, predators generally kill and consume the weakest of the prey animals. They are easier to catch and won’t fight back as hard as a healthy animal, which is very important because predators can’t afford to get injured. These weakened prey animals tend to be either the young, the old, or the sick. So if predators are eating sick prey animals they are getting rid of reservoirs of infectious disease that could introduce more infectious diseases to the other animals. But that’s not the case in this article, this actually involves the parasitic pathogens being predated upon, not the afflicted prey animals in what I thought was the conventional way. Very cool to see that once you change the scale of a predation situation that the conditions of the situation change in big ways. For predatory animals not to get sick it could be the fact of the fauna of their gut being capable of handling the diseases in the prey animal similar to that of carrion eating animals being fine after eating carrion, which while is not rotting but is still loaded with harmful bacteria. Also you have to consider they are not only eating sick prey items, just when the opportunity presents itself. Just like how we aren’t supposed to eat raw eggs due to food borne illness risks, but some people still do and are perfectly fine. Just because the microbes are there doesn’t mean you will get sick, just an increased risk. NOT ADVOCATING EATING RAW EGGS. There will be a point in our lifetime where we as a species will have to make a choice between perishing or joining together in a concerted effort to reduce our impact on this planet. It must start some where, but unfortunately politics and money will be determining factors as to whether or not the effort can begin. Conservation efforts are multifaceted and unless the major world powers can reach an agreement on how to approach these problems progress will be very slow, and in the end may be too little too late. An important fact to note is in the title of this blog: “small predator diversity.” The key word is diversity and how numerous and varying small predators all spread infectious disease. How do you control something that is diversifying ergo making itself stronger while the world itself is becoming more homogenous and weak? As stated above, global climate change is allowing these predators to find new homes in places that do not know how to defend themselves. Is there a pesticide that could be introduced to help maintain these numbers? But would that pesticide hinder more than help? What other ideas could be implemented to decreases the diversity of these small predators and slow or stop the spread of disease?